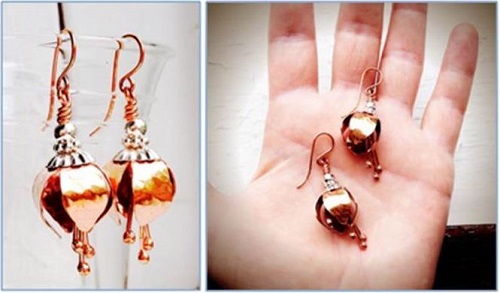 Just last week, reader Aims mentioned in the comments of the Christmas Wreath Tutorials how she liked to wear festive earrings. She has "One pair with bells that drive everyone nuts but me!" What about silent bells then? Judy Larson, a fantastic instructor who often shares her tutorials here, did indeed come up with a noise-free design. She said it reminds her of fuschias. 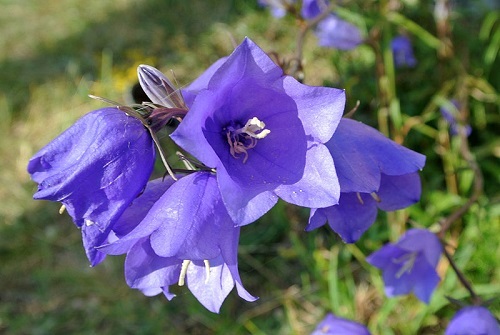 They remind me of unopened real bell flowers (Campanula species)! I liked how she actually flattened a metal bell to check the shape of the petals! Don't worry if you're not into jewelry saws. This one uses metal shears. Judy also anneals (torched the pieces to soften the metal) but I think you can get away without this step with 26G or 28G metal sheets if you don't work harden too much. A great project for beginner metal smiths! Update : In order to download, you have to join Slideshare (free). For mobile devices, you can download the app (free). It is the Linkedin Slide Share app available in both iTunes and Google Play. Once you sign in, it is easy to save it directly to your phone. Someone wanted to know how to download. Click on the link in my post above to be taken to Slide Share itself. You will see the tutorial there. Now scroll down - you will see the Download button just above my mug shot! The PDF will open up on your computer. You need to save it on your computer. Those are great! The possibilities are endless with them! I can imagine some enameling on them if you can do that...even just the tips....oh my!